Synthetic peptide corresponding to Human Ki67. Immunogen is from the 62 base pair region of the human Ki-67 antigen. Our Abpromise guarantee covers the use of ab833 in the following tested applications. IHC-P 1/25 - 1/50. Perform heat mediated antigen retrieval with citrate buffer pH 6 before commencing with IHC staining protocol. 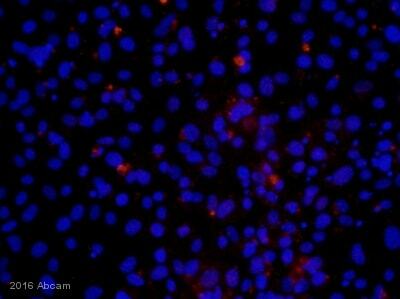 We recommend using an ABC system for detection of this antibody. IHC-Fr 1/25 - 1/50. 1/25 - 1/50. We suggest an incubation period of 30 minutes at room temperature and to use DAB to stain the protein. Required to maintain individual mitotic chromosomes dispersed in the cytoplasm following nuclear envelope disassembly (PubMed:27362226). Associates with the surface of the mitotic chromosome, the perichromosomal layer, and covers a substantial fraction of the chromosome surface (PubMed:27362226). Prevents chromosomes from collapsing into a single chromatin mass by forming a steric and electrostatic charge barrier: the protein has a high net electrical charge and acts as a surfactant, dispersing chromosomes and enabling independent chromosome motility (PubMed:27362226). Binds DNA, with a preference for supercoiled DNA and AT-rich DNA (PubMed:10878551). Does not contribute to the internal structure of mitotic chromosomes (By similarity). May play a role in chromatin organization (PubMed:24867636). It is however unclear whether it plays a direct role in chromatin organization or whether it is an indirect consequence of its function in maintaining mitotic chromosomes dispersed. Expression occurs preferentially during late G1, S, G2 and M phases of the cell cycle, while in cells in G0 phase the antigen cannot be detected (at protein level) (PubMed:6206131). Present at highest level in G2 phase and during mitosis (at protein level). In interphase, forms fiber-like structures in fibrillarin-deficient regions surrounding nucleoli (PubMed:2674163, PubMed:8799815). Phosphorylated. Hyperphosphorylated in mitosis (PubMed:10502411, PubMed:10653604). Hyperphosphorylated form does not bind DNA. Chromosome. Nucleus. Nucleus, nucleolus. Associates with the surface of the mitotic chromosome, the perichromosomal layer, and covers a substantial fraction of the mitotic chromosome surface (PubMed:27362226). Associates with satellite DNA in G1 phase (PubMed:9510506). Binds tightly to chromatin in interphase, chromatin-binding decreases in mitosis when it associates with the surface of the condensed chromosomes (PubMed:15896774, PubMed:22002106). Predominantly localized in the G1 phase in the perinucleolar region, in the later phases it is also detected throughout the nuclear interior, being predominantly localized in the nuclear matrix (PubMed:22002106). HT-29 xenograft tumor in mouse 20x pretreatment w/ citrate pH 6.0 using anti-Ki67 antibody ab833 at 5 ug/mL for 30 min at RT. 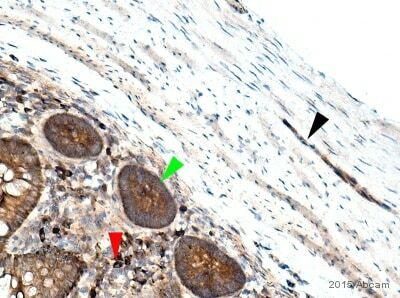 Immunohistochemistry (Formalin/PFA-fixed paraffin-embedded sections) - Anti-Ki67 antibody (ab833)Image from Medic S et al., PLoS One. 2010 Apr 22;5(4):e9977. Fig 3.; doi:10.1371/journal.pone.0009977; April 22, 2010, PLoS ONE 5(4): e9977. 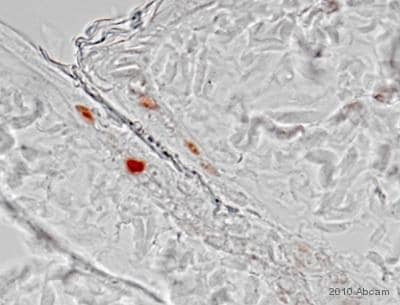 Immunohistochemical analysis of Human skin tissue, staining Ki67 (red) with ab833. Antigen retrieval was performed by heat mediation in a EDTA/Tris buffer (pH 8.0). Sections were blocked with 10% NGS for 1 hour at room temperature, followed by incubation with primary antibody (1/25). 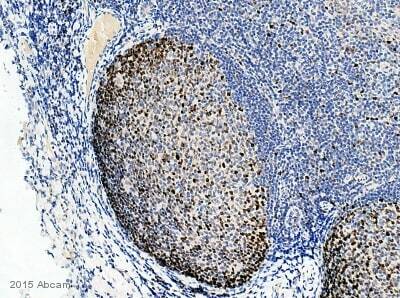 An AlexFluor®546 anti-rabbit IgG (1/500) was used as the secondary antibody. Immunocytochemistry/ Immunofluorescence - Anti-Ki67 antibody (ab833)This image is courtesy of an abreview submitted by Dr Mal Niladri, Cleveland Clinic. 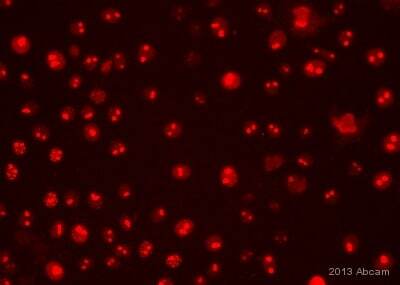 Immunocytochemistry/ Immunofluorescence analysis of HeLa cells labeling Ki67 with ab833 at 1/50 dilution. HeLa cells are the classic example of an immortalized human epithelial cell line from a fatal cervical carcinoma transformed by human papillomavirus 18 (HPV18) that grown as adherent cells layer and maintain contact inhibition in vitro. 2% paraformaldehyde for 15 min was used to fix the cells, and permealized the cells with Triton-X100 (0.1%) for 10 min and then incubated cells with primary antibody Ki-67 (1/50) for overnight at 4 degree centigrade. Image was taken using a confocal laser scanning microscope that equipped with an additional differential Interference Contrast (DIC) mode. Image here demonstrate DAPI (blue-nuclear stain, upper left panel), Ki-67 (Green, upper right panel, shows nuclear localization in actively dividing cells), Hela cells in culture-DIC (phase) image (lower left panel) and superimpose image (lower right panel). The expression of the human Ki-67 protein is strictly associated with cell proliferation. During interphase, the antigen is exclusively detected as several prominent specks within the nucleus and a weak finely dispersed staining throughout the nucleoplasm, whereas in mitosis most of the protein is relocated to the surface of the chromosomes. The fact that the Ki-67 protein is present during all active phases of the cell cycle [G(1), S, G(2), and mitosis], but is absent from resting cells [G(0)], makes it an excellent marker for determining the so-called Ki-67 staining index (Ki67-SI) of a given cell population. Formalin fixed paraffin embedded human tonsil stained with Ki-67, using ABC and AEC chromogen. Publishing research using ab833? Please let us know so that we can cite the reference in this datasheet. So I have attached an image taken of my staining. As you can notice, the staining is largely nucleolar not perinucleolar. I have indicated cells that have been transfected with white astericks, therefore the non noted cells are non trasnfected. 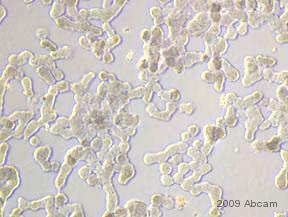 The transfected cells have largely diminished staining, but it is still detectable. Therefore, I am unsure whether these are cells that have become quiescent, or if they are no longer in G1. >As I mentioned previously, I would recommend running a no primary antibody control to ensure that the diffuse nuclear staining cannot be attributed to non-specific binding. If the no primary antibody control is clear, then I would conclude thatmost of yourtransfected cells are still proliferating. We are performing immunofluorescence using your anti-ki67 antibody on COS7 cells grown in culture, and see distinct nucleolar staining with a hazy nuclear stain. Cells are transfected for 48 hours. Fixed in 4% PFA. Permeabalized in Triton x100 (.5%). Then blocked and stained on coverslips. My question lies in how to quantify Ki67 positive and negative cells. Although we see a decrease in nucleolar stain in some of our transfected cells, the cloud of nuclear staining does not disappear. Should we then quantify the amount of of relative fluorescence between the transfected and non transfected cells? Or assume that depletion of Ki67 in the nucleolus indicates a cell in G0? Or is it that all of the stain should disappear for the result to be positive? Ki67 will be localized in the perinucleolar region in the G1 phase and in the nuclear matrix (your hazy nuclear stain) in the later S, G2, and M phases. During G0, Ki67 will not be detected. If you are looking to quantify interphase / division vs quiescence / senescence, you can simply look for number of cells showing any fluorescence vs the number of cells without Ki67 expression. In order to make sure that the nuclear staining you are observing is specific, it is always recommended to run a no primary antibody control.